So I watched the 24K Magic video the other day, and naturally thought about how popular that XXIV hat will get. And then it dawned on me - the baseball cap can be a key accessory for any dj. Why? Because it's like a window into your identity. Allow me to explain, and also highlight some interesting headwear you might like. Comfortable, breathable, and as you found out in my post about footwear, I wanted to show some brand allegiance by matching up with the waterproof boots. Also, no need to comb your hair before going out. Anyway, had to toss the hat when the brim got way too ripped up (after about 6-7 years), but it more than served its purpose. Can't go wrong with an original Adidas snapback. Iconic brand, and a safe choice that should fit right in wherever you spin or hang out. Never heard of the Goorin Bros. brand before, but the Naughty Lamb is a simple design that tells people you're a little different. Plus, it makes me think of Black Sheep's The Choice Is Yours, which never fails to get my head nodding. 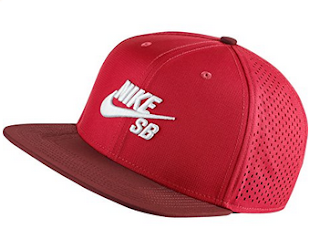 The Nike SB Performance Trucker Snapback looks like a light, breathable hybrid and has a deep, vibrant red that makes it stand out. I've never even touched a skateboard in my life, and I'd consider wearing this. Finally, it's playoff season in baseball. If you spin at the local sports bar and the home team is in the mix, can't go wrong with a fitted that shows you're down with the cause. Call me old-fashioned, but I'd peel that sticker off before putting it on. Which hat do you like the best?